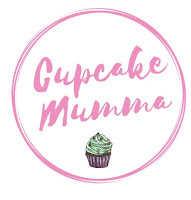 Cupcake Mumma: Listography ~ Cartoon Characters from your youth! Listography ~ Cartoon Characters from your youth! I wasn't too big on my cartoons (far too busy with Spice Girls!) but even I have a top 5 cartoon character list as asked for by the lovely Kate at Kate Takes 5. So, click the blog or the badge below to linky up yourself or just have a good look at everyone elses offerings! I loved this cartoon a huge amount. You know what? I still love this cartoon. The way Mrs Large tries to juggle housework,shopping,cooking all the while dealing with 4 rather inquisitive children. I also ashamedly like it when they always get one up on that neighbour (we must all know one, the 'my child is better than yours Mummy member of everything going') Anyway, great cartoon! It was my brother who loved this cartoon the most but I never remember complaining about watching it. I found it funny but must admit it wasn't Top Cat that was my favourite, I rather liked dear old Benny. 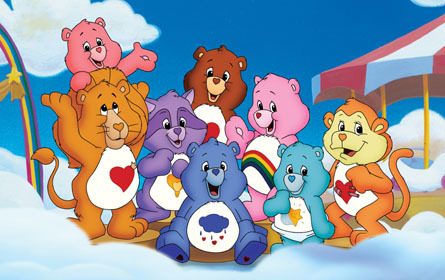 I LOVED the Care Bears had the video and all which was watched over and over. When I bought a video player from a charity shop last year I couldn't wait to play my old video...Only to find my mother had given it away a long time ago. It still hurts now! I always came straight home from school and tuned into Arthur. I still watch it on CBBC now with Little Miss. The imagination of all the characters is great and I must admit to liking DW..My favourite is Arthur's dog Pal..especially when he can talk to Arthur's baby sister Kate, how cool? It took me fricken ages to find this prompting everyone I spoke to in my family about a worm with a hat and one shoe that I was on drugs mad..But I'm not (mad or on drugs may I add) I loved this show, I wonder how many can remember this? It's still on Pop now (only discovered this recently to my utter joy) and I've just remembered I read the stories when I was in primary! Can I just cheekily add that The Moomins was a classic also but there's just not enough room! Well I must say the Busytown Mysteries are a new one on me as I've never heard of them, sorry! :-) Sounds like you're a bit younger than me though what with your number 1 and 4. OOOOOOH I REMEMBER BUSYTOWN MYSTERIES!! Only I didn't know it was called that. I was a bit busy with Spice Girls as well and figuring out which Spice I was meant to be. Only know of Top cat and the Care Bears on your list. Funny how some overlap, and others are new ones. I read my old Busytown book to my toddler! I didn't know there was a show either. Awesome. 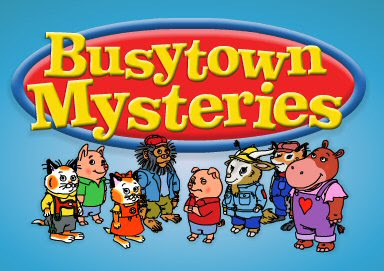 I'm so pleased you all know Busytown Mysteries!! That's cheered me up! I enjoyed this task, had a good think. I still watch Arthur too and must admit Top Cat wasn't my favourite!